- Part Number SPLINE A DIAM. B(mm) OVERALLLENGTHC ( mm SHIP WEIGHT IN KG. With the constant support of our technocrats, we are meeting the varied requirements of clients by manufacturing and supplying optimum quality Grooved Feed Bush. - Used in various drilling works and industries. Groove Feed Sleeve is generally used in groove feed geometry screw and barell set to give high output and best melting and mixing quality of final products. 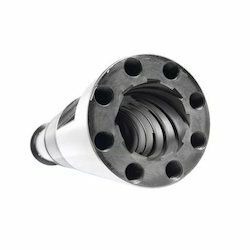 Groove Feed Sleeve is made out of different nitride steels like EN 41B, WPS and High Speed Steel materials. The Groove Feed Sleeve can be availed from us at the most competitive prices. Leveraging on our extensive market knowledge, we are providing a high quality range of Grooved Bushes. Being a prominent firm in this domain, we are engaged in offering a distinguished assortment of Grooved Feed Bush.